This is just my opinion ofc, but honestly (I think) if you're really looking to grow that HoopInDetail project you're working on, at some point you should get a mic and say the stuff that you put in text on the video. Die hard fans like the ones on forums will see the video regardless, but I can't see too many people being a fan of that style. It doesn't seem as professional. Getting a mic is pretty cheap too and would add a whole new dimension. Not to critique or (bleep) on your videos, I liked the video. Did Jordan Clarkson think Metta's 3 at the end was going in? "I don't know. He was shaking like a stripper in the corner." loved those insightful vids KIROE, but I agree with 1ngr4m. I was thinking to myself while watching them, "I wish these had audio." At the very least, maybe think about adding some music like draft express used to do. The vids just shouldn't be silent imo. Side note: guys like Dirk have had success in the past with a catapult-type shooting stroke. At this point in the game, Ingram probably has too much muscle memory invested in the 2-part stroke to completely abandon it. Other than the wasted 2 part motion, what bothers you most about his stroke? I know of you mentioned the legs and arms being out of sync last year. Hopefully he can at least fix that. 2K has BI at PF and LeBron at SF. What? I’m sure in 2K Ingram can be effect at PF, he can indeed play that position eventually if he gains strength and weight. He's probably not strong enough to defend the position. But offensively, he basically will be the PF. I imagine most teams will defend LeBron with their SF since the best perimeter defender is usually playing SF. That means Ingram will be defended by a lot of PFs this year. 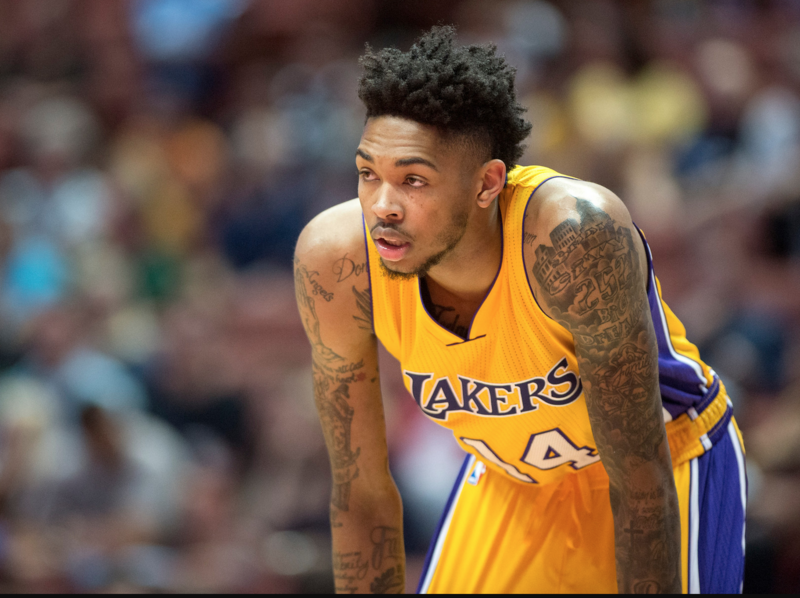 Ingram's (bleep) issue is a unique problem of his own because of his crazy long arms. They take longer to extend to release, so them starting from a point further back, behind his head --- takes too long -- he'll shoot on the way down. LeBron will spend a lot of time in the post. It would make a lot more sense to have the bigger, stronger wing defending him. He has post moves, but as I recall he doesn't commonly back bigs down or look to seal them in the low post. When he's there, it's because various other circumstances played out. If he's playing center, I just don't see him trying to be in the post, banging against a big, while everyone else runs freely around the court. That's never been how he finds his advantages. I mean, I'm just going off of what the Lakers themselves have said about how they're going to play and how he'll be featured in the offense. The point of playing him in the post is to preserve his energy so that he isn't burning it by doing a bunch of playmaking from the perimeter. Will he play exclusively in the post? No, of course not. But he'll be there a lot, according to the Lakers. This isn't something they're exploring. It's exactly what they've said they're going to do. They didn't stockpile on playmakers for roster decoration. If by "bigs" you're referring to traditional bigs (in terms of size), I don't think that's what the Lakers are envisioning at all for him at C or in the post. If the opposing team is dumb enough to put a big with traditional size on him, he'll take advantage of that mismatch by getting the ball in positions where he can attack off the dribble. And he'll do it as often as he can until the defense makes an adjustment. Otherwise, yes, I actually believe the Lakers when they say he'll be playing in the post a lot more than he has so far in his career. Right on, Lebron usually goes to the post against smaller players and distribues over the top. If he's against bigger, slower players, he's going to attack them off the bounce. If you are the opposing team who do you stick on Lebron? I am putting my best wing defender on him no matter what position he starts in! If BI can start shooting more three's and keep that same percentage (39) then he should be able to average 20ppg next year pretty easily. I really want to see him get up about 5 three's a game. I think Ingram's shot is just fine. It's going to get better I have no worries about it. Just need him to up the volume of 3pt shooting. ya, this is my thinking as well. Most teams will probably want their SF defending LeBron rather than their PF. This could give Ingram some favorable matchups against 4's. Here's a video of Ingram shooting some threes at the Lakers facility. More misses than makes. He seems to be filling out a little bit. He doesn't really look scrawny anymore. Kuzma is noticeably thicker well. On the Jump yesterday, they were making fun of how workout videos always show the makes, how no one ever misses in the summer highlight videos. Magic is going to fire whoever was filming. No doubt. I was just being facetious. These dudes are so damn good. Even the ones we think are trash shooters hit high percentage in workouts/practice. Your Humphries example is spot on. I saw a video recently of Javale shooting 3s...You would think he was a stretch 5. These guys are so good, especially when they are just practicing.